TO ORDER: Provide text by 11 a.m., 2 business days prior to issue date, with prepayment (cash, check, American Express, MC, Visa). Follow chart for rates and sizes. Ask about larger sizes. No logos. 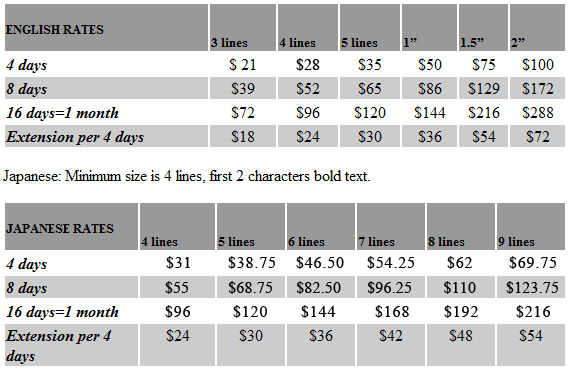 English: Minimum size is 3 lines with no bold text. 1 line is about 30 characters. 1” ad = 8 lines, some bold text. Cancellations: To quality for a full refund, notify us 2 business days prior to issue date by 11 a.m. If after this deadline, basic charge is $15, plus number of days printed. A returned check fee is $20. Changes/Refunds: No changes or refunds after the ad is printed. Extensions: Order by 11 a.m., 2 business days prior to issue date for a discounted rate.